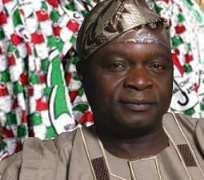 The suspended National Secretary of the Peoples Democratic Party (PDP), Prince Olagunsoye Oyinlola, has stated that his expulsion from the party, as recommended by the Umaru Dikko-led disciplinary committee cannot stand. In a statement issued on Thursday by his Principal Secretary, Femi Adelegan, Oyinlola maintained that the National Executive Committee (NEC) of the PDP, which is statutorily empowered to ratify the composition of the Dikko committee, did not approve it. Oyinlola said the committee hurriedly worked to the answer in a feverish bid to get rid of him before the hearing of a pending suit at an Abuja Federal High Court, challenging the various acts of illegality by the leadership of the PDP. He stated: 'No sane or decent person would be surprised at the recommendations of the illegally constituted disciplinary committee, which from the outset, shouldered a heavy burden of legitimacy, integrity, lack of respect for fair play, principles of natural justice and the rule of law. 'It is patently clear, that the Dikko committee acted under questionable circumstances as if the PDP were a mere mechanical contraption that could be manipulated without respect for laid down rules and regulations. 'The Dikko committee is a comical show of the absurd that could only erode whatever remains of the credibility of anybody who decides to circumvent regulations and rebuff a law court. 'Indeed, the questionable manner in which the committee has carried out its commissioned assignment, and the end results of its members' contributions to the deviant posture of the NWC, which has chosen to disrespect the Judiciary serially, would stand eternally in their records.